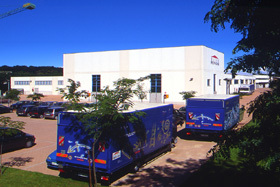 The production of textiles and the finishing process, the extrusion of aluminium, the rotary pressing and moulding of plastic materials are all carried out in the Peroni production centres situated in the provinces of Varese and Milan before being transported to the headquarters at Gallarate, a 5,000 m² complex where the materials are stored and then used for the creation of projection screens, backdrops, mechanical apparatus for scenic elements, and so forth. Calendered or doubled, they are manufactured to specifications set by Peroni technicians. Constant experimentation has led to a significant evolution, in particular for materials used for front and rear projection, now top quality on the market. 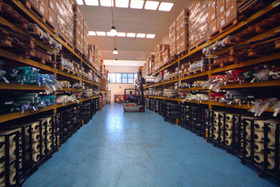 Dance floors and reflective and decorative materials for backcloths and cycloramas complete the range. 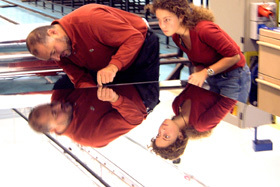 Photo: the realization of a scenographic mirror. Front and rear projectrn screens, backdrops in decorative film and backdrops digitally printed are cut to measure and carefully assembled with high-frequency welding. 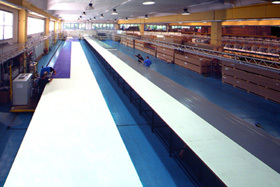 At Gallarate's plant, other than screens for cinema and theatre, it is not unusual to see the manufacture of cycloramas reaching dimensions of 3,000 or 4,000 m². Photo: the high-frequency welding department, where are made the largest projection screens in the world. 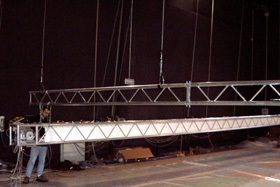 The scenic mechanisms department produces tracking, rigging systems and many other devices for mechanical stage effects. It also sees to the assembling and motorization of mechanically operated screens and special machinery designed and manufactured to client specifications. Photo: the checking of a mechanically operating rolled screen in Gallarate's plant testing theatre. Peroni produces high quality prints on traditional supports (canvases, film for rear projection, dance mats) specially prepared for digital printing. 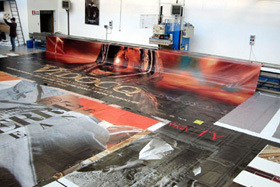 The sewing and welding departments assemble the printed sheets, to make up backdrops that often reach gigantic proportions. The technical offices at the Gallarate headquarters collaborate with the professional studios appointed by the client in the planning of scenic works, often carrying out feasibility studies. 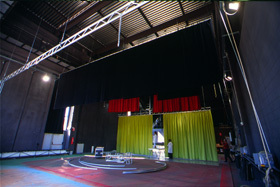 Photo: the test theatre annexed to the Gallarate plant is equipped like a real stage and is often used to effect experimental installations. The assembly department at Gallarate installs scenic elements realized by Peroni for theatres, film and television studios and every type of production, and carries out both regular and extra maintenance at the client base. 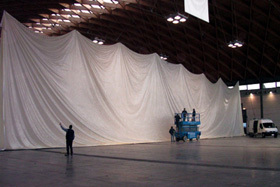 Photo: the installation of a giant rear-projection screen in the pavilion of a fair exhibition. The Peroni storehouses, situated in various company locations, today make up one of the largest repositories of scenic material worldwide. Fabrics for stage design, plastic films for screens and backdrops, articles for mechanical scenery and every other kind of material used for scenic purposes are ready for the most rapid delivery. Photo: the storehouse at Gallarate's complex.